Latin America is better prepared for confronting the worst effects of the El Niño weather pattern than it has been in the past, according to a leading climate scientist working in the region. Juan José Nieto, Head of Climate Services at the International Research Centre on El Niño (CIIFEN), made the comments at a recent forum, held in the Bolivian capital of La Paz, which saw experts from various South American countries gather to discuss the potential impacts that the current El Niño event will cause across the region. The current episode is already one of the strongest on record, and is forecast to reach its peak in the next few months – El Niño events usually peak around Christmastime, which is where the phenomenon gets its name (el niño meaning ‘the child’ in Spanish, a reference to the baby Jesus). Past occurrences have unleashed catastrophic weather events in Latin America and around the world, with extreme rainfall events (intense storms and flooding or prolonged droughts being the most common) often leading to widespread damage to food crops and infrastructure, as well as aggravating water stress in regions already prone to water shortages. However, according to Nieto, “we have seen that, compared with previous years, there is a coordination on the part of authorities on a regional scale, there is action on the part of these authorities to gather the information that is on offer and to take appropriate measures across different sectors, to the extent that each country is able to do so”. He added, as a way of conclusion, that on this occasion “the region is better prepared, or at least better informed for confronting the impacts of El Niño”, and that the staging of events such as the La Paz forum were key to the sharing of vital information among those authorities who are responsible for taking decisions in their respective countries that can help prepare them for the worst that El Niño has to throw at them. One expert in attendance was Luis Noriega, the director of Bolivia’s National Meteorology and Hydrology Service (Senamhi), who agreed with Nieto’s stance that Latin America was in a better position than in the past. Noriega highlighted the fact that national authorities now had resources such as satellites, computer modelling, and a greater number of weather stations, all of which made it possible to give more accurate forecasts, and have left the general public better prepared. In response to the warnings that the current El Niño event could be among the most powerful on record, several governments have announced drastic measures to try and shield their countries from the worst effects of the phenomenon. Ecuador, for example, has declared a state of emergency in 17 of its 24 provinces due to the impending arrival of El Niño, with President Rafael Correa ordering the Ministry of Finance to “provide sufficient resources to address the situation of emergency” for 60 days. Authorities have cited the catastrophic damages done to the Ecuadorean economy during the 1997-1998 El Niño event as the reason for the preventive measures: during that particular episode, extreme weather resulted in losses equivalent to at least 14% of Ecuador’s annual GDP, and experts are comparing the current El Niño event to the 1997-1998 one, which remains the strongest ever recorded. 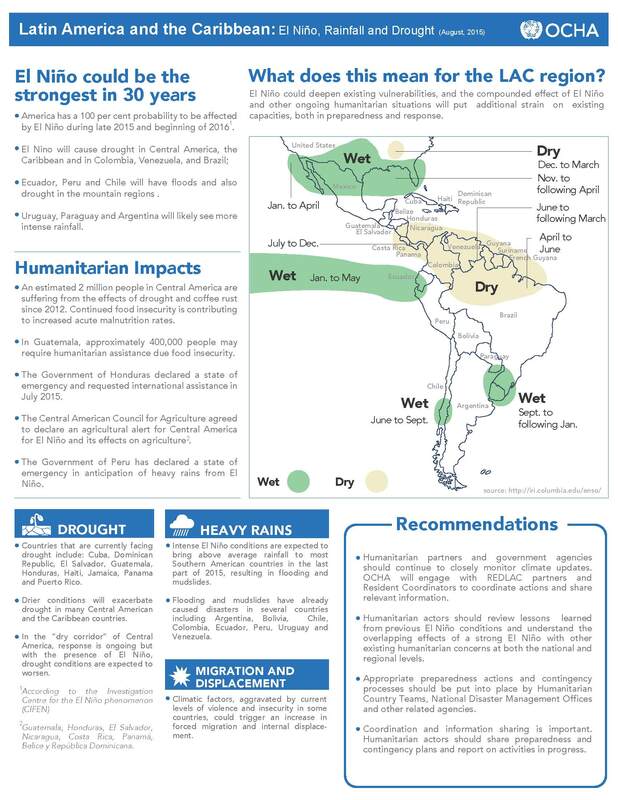 Infographic from the UN Office for the Coordination of Humanitarian Affairs (OCHA) showing the various impacts of an El Nino event on different parts of Latin America. The phenomenon is set to have a wider impact on the rest of the continent, and could well aggravate a number of extreme weather events that have been gripping different parts of Latin America in recent months. An ongoing drought in Central America has affected around 3.5 million people and left more than 2 million needing food aid, and while the region has been hit by a lack of rainfall since way back in 2014, experts are in little doubt that the strength and duration of this El Niño event is making the situation worse. Meanwhile, much of the northern part of South America has also been crippled by a lack of rainfall that has affected communities across Colombia, Venezuela and north-eastern Brazil, and led to an unusually intense outbreak of wildfires throughout the Amazon. At the opposite end of the scale, southern areas – particularly Argentina, Uruguay and Paraguay – could well see an extension of the heavy rainfall that has led to flooding throughout the past six months, with some areas registering as much as three times the average rainfall between August and October. Meanwhile, a separate report from the UN’s Office for the Coordination of Humanitarian Affairs (OCHA) has shown that 13.2 million people were affected by natural disasters between January and October 2015, already comfortably above the 11.4 million affected throughout 2014. The report noted that 7 million have been affected by drought and 2 million by heavy rains and flooding, and warns that the situation could be exacerbated by the current El Niño due to the expected intensification of the drought in Central America, and of heavy rainfall in southern South America. 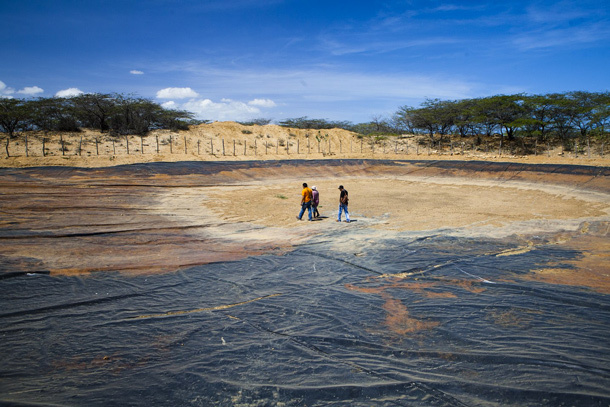 Experts and authorities across Latin America are hopeful that the region is better prepared than ever to deal with the fallout from a strong El Niño event. If the predictions of a wave of extreme weather events across the region over the next few months do bear out, then there will be many millions of people relying on these confident statements to be true. Northern Colombia has been one of several regions affected by severe drought over the last couple of years, and a strong El Nino is likely to make a bad situation even worse. Photo courtesy of the World Food Programme (WFP).